In today’s technological world, you can get in contact with just about anybody, and remain in contact for that matter. For me, the former happened and I’m certainly fortunate, as well as thankful that it did, and if the latter should develop, then I’ll consider myself forever blessed. I recently came in contact with former jockey Mike Manganello. When the 2015 Kentucky Derby is held this year on Saturday May 2nd, it will mark the 45th anniversary to the exact date of Mike’s winning ride aboard DUST COMMANDER in the 1970 Kentucky Derby. Mike informed me that he always likes to talk about Dust Commander, so imagine my overwhelming feeling when he agreed to field questions from yours truly about the horse and the 96th running of the Kentucky Derby. HRN: First off Mike, I was only twelve when I watched Dust Commander win the 1970 “Run for the Roses” on television with my Dad, so excuse me for being late to the party. But as the saying goes, “better late than never”, even if 45 years have passed. CONGRATULATIONS on the win. Before we get to Dust Commander and the 1970 Derby, let’s give our readers some highlights about your career. HRN: You were 29 years old when you won aboard Dust Commander, but at what age did it all begin and at what track did you launch your riding career? MIKE: At the age of 15, I went to work at Narragansett Park in Rhode Island for Odie Clelland. I worked as hot walker and exercise rider for 3 years and rode my first race at Narragansett in November 1959. The following year, March 3, at Fairgrounds in New Orleans, I rode my first winner aboard Will Step, a 2 year old maiden. She made her first start and I won my first race. We both broke our maiden. I went on to ride many winners as an apprentice rider and lost my apprenticeship one year later. I rode a couple of years in New England, then moved my tack to Cleveland, Ohio, where I became Leading Rider at Thistledown and Randall Park for several years with great success. I then moved my tack to Churchill Downs and Keeneland for the spring/summer/fall meets and Florida in the winter where I also had great success, also becoming Leading Rider at those meets for several consecutive years. HRN: In 1964, you once won 5 straight races at Thistledown. You were a fan favorite at Florida Downs (now Tampa Bay Downs), where in 1968 you won 4 races on a single card and set a season record with 75 victories the following year. Five times, including 4 consecutive years in a row, you won 5 races in a single day at Turfway Park. One of those occurrences came in Turfway’s Fall Championship Stakes. By the mid ’70’s you had collected multiple riding titles. You retired from riding having amassed over 2500 wins, including numerous graded stakes. Those were significant accomplishments. Certainly a career to be proud of, and the cherry on top of it all is, you can proclaim you won the Kentucky Derby. MIKE: I also won 5 races on one card at Churchill Downs on May 14, 1968. I am very proud of my career and you are right that the Kentucky Derby is the cherry on top. HRN: You first retired from riding in 1979 to train horses. You had your own public stable. You did that until 1984, then returned to riding. What was the main reason for getting back in the saddle again? MIKE: The main reason is that I missed riding and the competition of riding. I had some success as a trainer and trained for some amazing owners including Mr. George Steinbrenner, owner of the NY Yankee’s and Lloyd and Ann Ferrentino. HRN: You later went on to become a racing steward, a position you currently hold. Tell us about that. MIKE: I was offered a stewards position in 1991 at Manor Downs outside Austin, Texas. Then moved on to Bandera Park in Bandera, Texas, then at Retama Park, San Antonio. I worked for several years in Texas before moving on to Michigan, Indiana, and Ohio where I presently work as a Steward at Belterra Park. 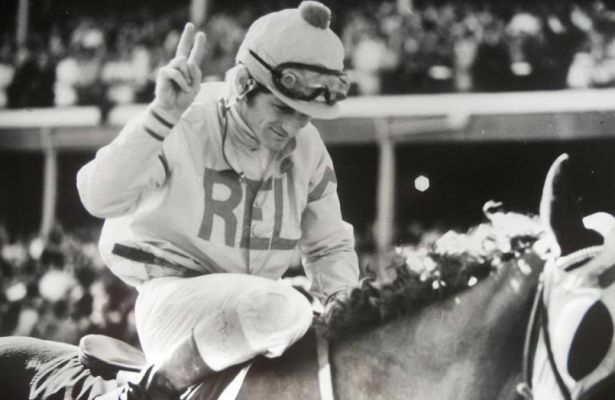 HRN: You rode in five editions of the Kentucky Derby, however, 1970 wasn’t your first Derby ride, but rather, it was your second. You had your first Derby mount two years prior aboard Te Vega. That was the infamous Dancer’s Image/Forward Pass Derby. What was your feeling going into that race knowing it was not ONLY the Kentucky Derby, but your first one? MIKE: I was excited and honored to be named on Te Vega in the Derby. It was a great feeling just to be part of the Kentucky Derby. The greatest race in one of my lifelong dreams. The other of course was to win it. I will never forget the sound of “My Old Kentucky Home” being played during the post parade. The sounds of the song and crowd reverberated through me. 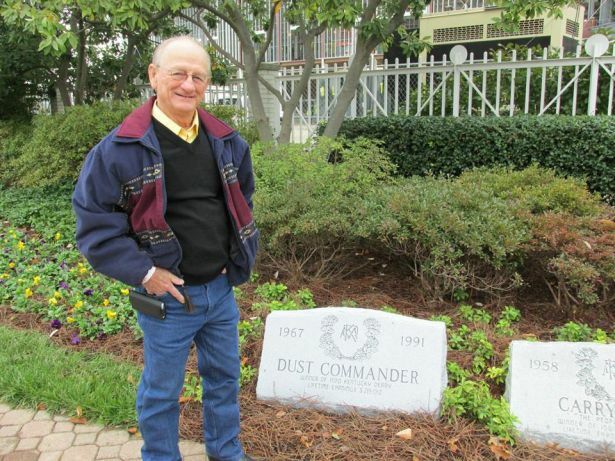 HRN: As a rider, tell me your relationship with Don Combs, Dust Commander’s trainer. Had you ridden other horses for him in the past? How did you end up acquiring the mount on Dust Commander? MIKE: Dust Commander is the first horse that I recall riding for Don. I met Don at the beginning of the 1970 Spring Meet at Keeneland as he was looking for a rider for Dust Commander, and my agent, Bob Peabody was at the right place at the right time and acquired the mount for me. I rode him the opening week in a 6 furlong race and he ran well and finished 5th and was closing. I really like the way the colt was finishing at the end. The following week, I rode him in a mile and 1/16 race which he won. He impressed me even more. The last week of the meet, he ran in the Bluegrass going a mile and 1/8 and we won! Coming into the Derby at Churchill Downs, I felt good about our chances. Don and I remain friends today. HRN: No one thought of Dust Commander as a horse who could win the Derby. Was it because he was Illinois-bred, was it because bettors thought his Blue Grass win at 35-1 odds was a fluke? Why do you suppose the little chestnut colt was overlooked in the days leading up to the race? MIKE: Because everyone thought that his win at Keeneland (Blue Grass) was because of the muddy track. HRN: The Catholic Archbishop of Zambia, who was in attendance and was friends with owner Robert Lehmann, blessed Dust Commander prior to the race. If the bettors had known the ritual had transpired, Dust Commander’s odds probably would have been significantly lower than 15-1. Were you present when the Archbishop called on divine intervention, or were you still in the jockey’s room getting ready? MIKE: I wasn’t present when the blessing occurred but was told about it. The owner, Mr. Lehmann had been hired to kill a tiger in India that had been raiding villages and had arrived home the morning of the Kentucky Derby. He had in his pocket, neck bones from the tiger and that was also a sign of good luck. He did show me the neck bones in the paddock prior to the race. The Archbishop’s blessing, the tiger bones, and my St. Christopher Medal that had been blessed by Pope Paul VI were all the luck I needed…the rest is history. HRN: Shortly before the 1970 Derby was about to go off, down comes this parachutist and lands on the infield on the backside of Churchill Downs. The race went off as scheduled, but when this incident occurred, were you and the others riders aware of it? Had the horses already began their warm-ups, or had they yet to come out onto the track? MIKE: I heard about it after the race but don’t recall seeing it or hearing of any disturbance with the horses on the track. HRN: The 1970 Derby featured the horse that would go on to be that year’s top 3-year old, Personality, the 2-year old champ from the previous season, Silent Screen, and stakes winner My Dad George. All three of those rivals were well supported in the betting, with My Dad George sent off as the favorite. Now when Dust Commander stepped onto the track for the post parade, did you glance at the odds board? After all, Dust Commander was a stakes winner, even conceding the fact it happened as a long shot, but you had to be wondering why there was such a discrepancy in the betting odds. Or maybe you didn’t care because your confidence was high? MIKE: Yes, I always looked at the odds board during the post parade…it was habit. I didn’t care because I felt so good about our chances of winning that I just wanted the bad luck to stay away. 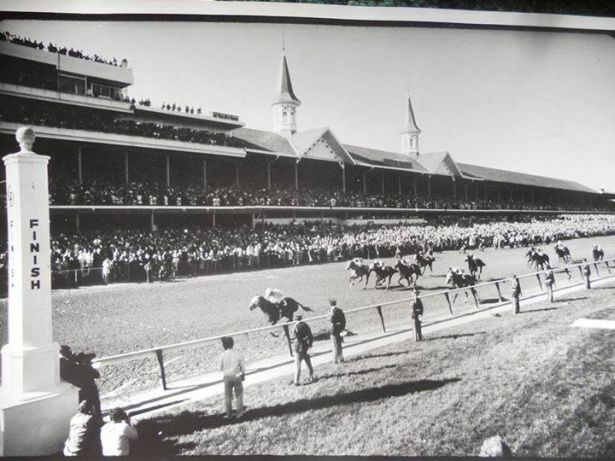 HRN: On May 2nd, 1970, the 96th running of the Kentucky Derby goes off at 5:42pm. A little over two minutes later, you and Dust Commander reach the highest point in American horse racing. Describe your frame of mind and the feeling thundering through your body when you crossed under the finish line knowing you had just accomplished what every jockey in America dreams of? MIKE: I was the happiest person in the world at that moment. For as long as I can remember, I wanted to become a jockey and win the Derby. HRN: You drew an inside post for the race. After the gates open, you get Dust Commander a good spot on the rail, saving ground most of the way until the top of the lane. At that point, you angle Dust Commander out a bit to get him in a good position to win the race. If you will, take our readers from that point of the Derby to the finish line. MIKE: We did have an incident leaving the gate where the horse on the outside of me ducked in and bumped me fairly solid. I had to check my horse and drop down to the rail and let him settle in stride. He gradually picked up momentum and I continued along the rail where I had moved up to 9th position and continued to pick up momentum without any encouragement. Each time I asked him to advance a little, there was opening on the rail, we are now about in 5th position along the rail. When we were coming to the head of the stretch, I had to come around one horse and went between 2 horses and at that point, he was going to the lead and I reached back and tapped him and he opened up a couple of lengths and I continued to tap him and he opened up 5 and won by 5 with room to spare. I knew though, at the 1/8 pole we were going to win. HRN: Dust Commander won comfortably by five lengths. Had you worked the horse in the days leading up to the big race, and if so, how was his morning training? Did the horse feel differently under you in the Derby than he had in previous races when you rode him? Did Dust Commander give you ANY indication that the stretch acceleration he displayed was going to happen? MIKE: I never galloped Dust Commander so I don’t know how he trained but every race I rode, he always gave me the impression that he was a good closer and responded to my urging. HRN: The pace of the Derby was moderate to slow. The pacesetter was a horse named Rancho Lejos. He went :23 1/5, :46 4/5 and 1:12 for the first three-quarters and basically wasn’t challenged at all. At one point, the leader had a three-length lead. Were you concerned the front flight might not back up? Could you sense the tempo of the race wasn’t unfolding as quickly as you wanted sitting where you were with Dust Commander in the early going? MIKE: I was never worried about the pace. The way my horse was running without urging, I knew he would be there for me when I asked. I felt good every jump of the way. HRN: How was the Churchill Downs surface playing that day? Was it favoring closers, because not only did your horse come from off-the-pace, but the horses that eventually finished 2nd through 4th place came from even further back in the pack? Those three horses ended up being separated at the finish line by just a half-length, but you got the early jump on them and it was Dust Commander’s day. MIKE: It had been muddy that morning, however, it had dried by the afternoon. I think that the distance of the race favored closers. HRN: You had to ride against some big-time horse racing legends to get the Derby job done. Riders that had been around a longtime. Names such as: Bill Hartack, Bill Shoemaker, Ismael Valenzuela and Braulio Baeza. They not only possessed tons of Derby riding experience, but they were all Derby winning riders themselves. However, through patience and perception, you were triumphant against them. MIKE: I had ridden races against all of them in previous races at Churchill Downs and I was not intimidated by their Derby winning experience. I also had a lot of stakes races under my belt too. HRN: In 1968, you were part of a group of jockeys competing at Churchill Downs who signed an informal agreement declaring they would not compete against Penny Early, who became the first licensed female rider in the U.S. and was trying to become the first female jockey to ride at a major racetrack. Horse racing today is still male dominated, but women are much more prominent AND successful as both trainers and jockeys. However, back in that era, women were virtually non-existent in the fabric of the sport. So in 1970, in the very same Kentucky Derby that you won, Diane Crump becomes the first ever female jockey to ride in the race. What transpired during that two-year period with the male jockey contingent at Churchill, who had unanimously refused to ride in races featuring a female jockey, but now were willing to compete against a female rider at a major venue? MIKE: First, let me preface this by saying that I did not have an issue with her being a female rider. I took issue with her lack of experience as a jockey and felt that she was more about publicity and therefore, my concern was safety. I never took issue with any other female rider since then and in fact, I always tried to help female riders if they wanted the advice. PJ Cooksey being one of them. Diane Crump had ridden in many races in Florida and Kentucky, was a very capable rider and knew what she was doing. She won many races. There may be some who don’t want to race with women, but there are very few. There are some very talented female riders out there today. HRN: What was the mood of the male jockeys getting ready to ride in the 1970 Derby, knowing a female rider was about to make history? Were any of you apprehensive at all? MIKE: The mood was okay that day. We all accepted that she was riding in the race and all felt confident that she knew how to handle a horse. She rode a good race as always. I had dinner with her last spring and we were talking about the race, and she said she didn’t win the race, but we reminded her that she didn’t finish in last place either. HRN: Dust Commander started nineteen times after the Derby, but sadly, he won only once, and it took place at….Churchill Downs. Were you aboard for that allowance win? MIKE: No, that was Don Brumfield. HRN: Dust Commander was retired to stud duty after racing. He sired the 1975 Preakness winner Master Derby and also multiple stakes winner, Run Dusty Run, who ran second behind Seattle Slew in two of the three Triple Crown races of 1977. Dust Commander passed away in 1991 on a farm in Paris, Kentucky, and was buried in an unmarked location. The farm changed ownership, the property was divided up and his grave lost. Over the years, the Lehmann family’s attempts were unsuccessful in finding Dust Commander’s grave. However, in 2013, a collaboration between the Kentucky Derby Museum and the Thoroughbred Museum in Paris, Kentucky, uncovered his grave. The remains were exhumed and tested through forensic science and a positive identification was made. Tell me your reaction when you heard the news? MIKE: It was sigh of relief knowing that he was going to be laid to rest in an honorable place. HRN: The remains of Dust Commander were placed in a handcrafted box and brought to his final resting place (On the grounds located outside the Kentucky Derby Museum.) He is interred there along with 4 previous Derby winners, Brokers Tip (1933), Swaps (1955), Carry Back (1961) and Sunny’s Halo (1983). You attended the ceremony along with trainer Don Combs and Mrs. Lehmann. 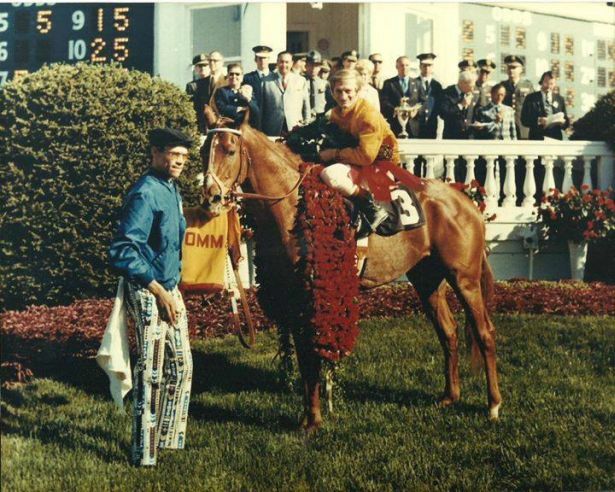 What were your emotions that day knowing that the horse that carried you to Derby glory back in 1970 and wore the coveted garland of roses was FINALLY home? MIKE: It was a very emotional day. It was such an honor to be part of the ceremony and seeing my big horse being interred beside such historical horses at the Kentucky Derby Museum Garden. Verna Lehmann, Don Combs, and I were proud to sign our names inside the box of his remains. The Call to the Post and My Old Kentucky Home were played one last time by the track bugler. A priest gave a brief eulogy and he was finally laid to rest with the honor he deserved. I visit with him often. I also cherish the relationship I still have with the Lehmann family. Verna and her children are still a huge part of my life and we celebrated the Derby victory back then and still do to this day. HRN: Mike, on behalf of Horse Racing Nation and myself, I want to express our deepest thanks for allowing us to talk with you. Hope to see you this coming May 2nd in Louisville. MIKE: Thank you Nick, it’s been a pleasure walking down memory lane. Let me know when you get to town. On May 2nd, 1970, Dust Commander was implicitly in COMMAND of the 96th Kentucky Derby and the rest of the field saw his DUST.